Phantoms in action against Telford last season. Peterborough Phantoms have blamed a weekend fixture farce on a ‘mis-communication’. 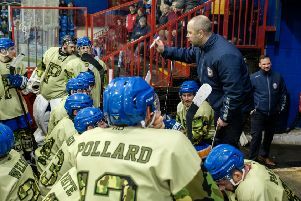 The city club were due to travel to Telford on Saturday (September 15) in the NIHL Autumn Cup before hosting a return clash at Planet Ice on Sunday (September 16). But those games have now been reversed with Phantoms entertaining the Tigers on Saturday (6.30pm) before heading to Shropshire the following day. Clashes against Sheffield Steeldogs in the same competition on September 29 and 30 are also subject to change. Phantoms are again due to be at home on the Sunday that weekend, but could now have to host the Steeldogs on the Saturday instead. A statement from Phantoms confirmed: “Unfortunately a mis-communication between the fixture secretaries of the NIHL North and NIHL South leagues has resulted in these fixtures clashes. “As Telford are unable to gain ice on Saturday this weekend’s games now unfortunately are changed. Phantoms won both pre-season games last weekend when beating Basingstoke 3-2 and 5-2 in the Billy Glover Memorial Cup.